OCT. 5-7: Going to eCWNC18 #Nashville? Tag Scriptel! When it comes to eClinicalWorks' special events, healthcare pros can always look forward to memorable moments. Scriptel's made a slew of them over the years. 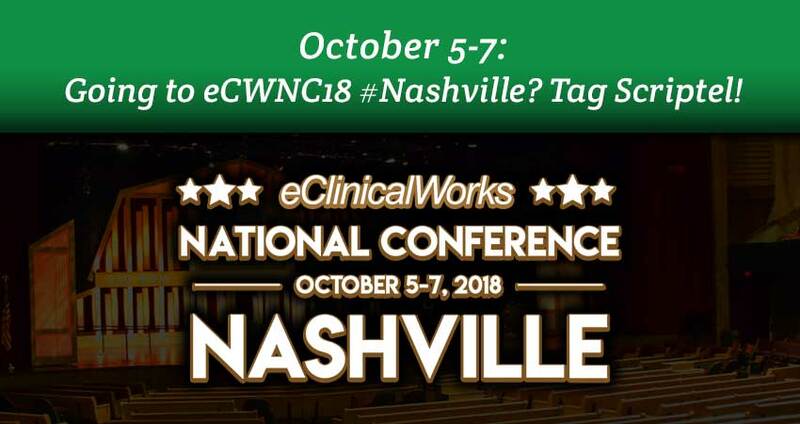 In October, this eSignature technology and health IT solutions vendor has grand plans for connecting with those enterprise partners—as 4,000+ folks head to Nashville for the 2018 eClinicalWorks National Conference held Oct. 5-7, 2018, at Gaylord Opryland Resort & Convention Center. Sadly, we can't be there in person to share news of our digitizing solutions or to lead you through hands-on capacitive touchscreen demos. What we will do, though, is stay tuned in via social media and send a few friendly shout-outs your way. Connect with us now, if you haven't already liked or followed us on Facebook, Twitter, and LinkedIn. Be on the lookout for special posts. Some will be addressed to the amazing eClinicalWorks team at #eCWNC18. Others will be specific to attendees enjoying #MusicCity without us. All of them will help us be there in spirit—thanks to the power of technology. "eClinicalWorks has been and continues to be a stellar (eHealth) enterprise partner to us," says Stephan Herron, CEO & President of Scriptel. "(Together we) strive to provide the best service, support, and end-user experience anywhere." Scriptel, he adds, is excited to stay in touch and to keep up with the event. We'll also spread word of this celebration of health information management far and wide through our own network of loyal followers. And, while lots of things make Scriptel unique, its commitment to customer engagement is simply one of them. Save time, money, and worry with Scriptel. Find out how—from anywhere at all—by claiming your 30-Day Risk Free signature pad trial at Request a 30-Day, Risk-Free Trial at Scriptel.com. P.S. – Remember to tag #Scriptel in your snaps of Cooter's Museum & Store, Grand Ole Opry, Madame Tussauds, Willie Nelson & Friends Museum/General Store, etc.